In early October, Microsoft had a big launch party in NYC. 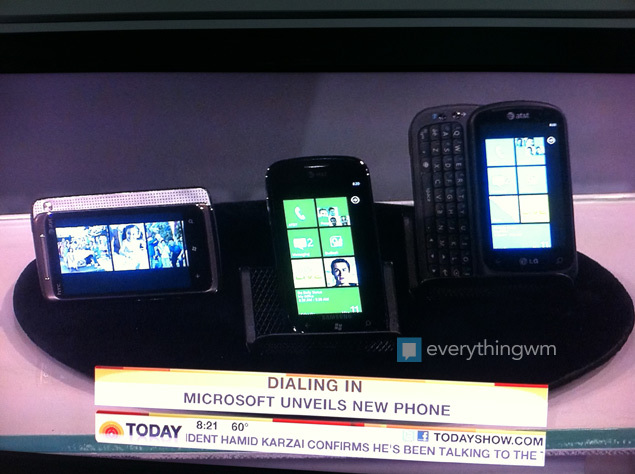 Steve Ballmer was on the Today Show and the coming out party for Windows Phone 7 was underway. This was more announcement party than launch party, since the phones weren’t available initially. That would come a month later or in the case of the Dell Venue, TBD. There were no lines to speak of, unless you count the few stores that featured Minka Kelly. Local AT&T retail locations in my area had a handful of each device, more than enough to meet the demand, which was minimal. LG, who joined HTC and Samsung as WP7 launch partners, have indicated that sales were disappointing. While it’s in vogue to blame Windows Phone 7, it’s the flagship phone that’s the missing ingredient. Let’s take a look at that other platform with the green guy. It took years for Android to take off, but look no further than the Droid for why it took off. It’s marketing and positioning. For Verizon customers, Android became the alternative to the iPhone. If you were sticking with Verizon, you likely left one of their stores with an Android phone. Up until the immensely successful Droid campaign, it could have been with HTC’s Droid Eris. What Verizon did with the Motorola Droid was create a flagship phone for the Android platform. Outside of tech blogs and phone geeks, regular folks weren’t talking about Android phones. Those Droid commercials changed the fortunes for Android. Sales volumes have gone up and so has developer interest. That’s not to say sales would not have been brisk. Android was positioned well against the dated OS on RIM’s BlackBerry line and the Droid ship had sailed by the time webOS phones hit Verizon. Now let’s switch gears to revisit the Windows Phone 7 launch on AT&T, which is the larger of the two carriers where you could purchase a Windows Phone device. Immediately, you are in competition with the iPhone, not to mention a handful of Android devices like the Samsung Captivate. When you look at the devices, there is no clear-cut horse to get behind. Most pundits penned the Samsung Focus as the best of the AT&T devices, but it was just another phone amongst a table of phones in front of Steve Ballmer. People don’t watch those commercials and think, I want that Samsung Focus or that HTC Surround. There is hardly any differentiation between the two, at least from the 60 second ad clip. They see Windows Phone 7, which is the intent of Microsoft’s campaign. There is no hardware that sells the platform, no flagship phone that stands above the rest. Don’t get me wrong, I think the current line of devices are very good, but just how they got lost on that table in front of Ballmer, they are getting lost on the shelves at AT&T. Now that Verizon will have the iPhone, the race for marketing dollars from phone manufacturers will be heated. For Microsoft, they simply make the OS, so they are somewhat removed from that process. The last time they worked with Verizon was on the KIN and that didn’t work out so well. Windows Phone 7 is not the KIN, but at least the marketing was device specific. Somehow they need to partner with HTC, Samsung or even LG to make a phone that will be worthy of Verizon’s marketing dollars. Verizon has an impressive lineup due this year, so the challenge is becoming increasing greater. Verizon will have the iPhone 4 on February 10th and big Android releases in the HTC Thunderbolt and still-unnamed LTE compatible Samsung phone. For the first time, AT&T will have one of the hottest Android phones in the Motorola Atrix. The time for a flagship Windows Phone 7 device is overdue and it might just be the reason why sales are not impressive. It’s not the operating system, it’s delivering a Windows Phone that stands out from the rest on the table. While the table of devices will help drive adoption over time, it’s the flagship phone that will get them back in the race. A phone that is not in stock, sold exclusively online and works on the fourth largest carrier is not what I would define as a flagship phone. Nor has anyone else, for that matter! I have two 16gb Dell Venue Pros, and they rock! Awesome phone. I agree that there isnt a “standout” phone in WP7’s lineup, that could be due to all 10 phones are just at Microsoft’s minimum hardware requirements levels (save for storage and camera), and none have something better. Dual core or 1.2Ghz phones are mostly on android phones for now, but if Microsoft’s decision standardize it’s phones does result in a lack of a clear cut winner. Take the Samsung Focus for instance. It’s a great phone with a stunning display. It also has very plastic feel to it. Did Android had a flagship phone? is it now surpassing iphone because of so many options – yes. So why would they want to push the lesser marketing model of Apple, when Android seems to have the better model to follow. And remember, Apple is a hardware company, MS and Google, software. Android took off with the Droid, a flagship phone. Subsequent Droid releases have built upon the success of the original. Did you really say that Apple has a “lesser marketing model”? Do you not remember all the “I don’t” ads for the release of the Droid? and how much they still push the Droid lineup? I remember the 1st time I had seen a “I Don’t” ad. I thought, “I hope who ever is coming out with this Droid better be ready for a fight…” they were…. and now I own one. I think you’ve replied to the wrong comment. I agree with you. Those ads hit like a ton of bricks. Compare the Droid ads to the AT&T ads I’ve posted in the article. No comparison. The idea behind WP7’s minimum system requirements was that it allowed developers a standard set of specs to aim their apps and games at. So a phone with a more powerful processor likely isn’t going to make much of an impact. Someone with that phone wouldn’t really see the benefit from that processor. At this point, adding more RAM than 512 will likely not see an additional benefit. The Samsung Focus has two things going for it that make it stand apart from the crowd. Its screen and the possibility of adding extra memory in the future through an SD card. It’s not enough to really make it a flagship device, but considering the above two statements I made above, it’s close. A phone could differentiate itself from others if it had a large amount of storage. If any WP7 device were to have 32 GB of storage space, I believe it would likely jump to the top of the list of WP7 handsets. And if that phone happened to also have a large SAMOLED screen, all the better. But would it be a flagship device? I’m not sure. It seems that the reality is that MS wants all of its devices to be ‘flagship’ devices. Yes, it sounds silly. But as MS puts out each update, the OS becomes more and more feature filled. And if MS still has room for optimizing how the managed code interacts with the device, then we could possibly see 3rd party apps responding more briskly than before. Imagine that. A device that acts like it’s getting better and better the longer you have it. As cheesy as that sounds, this I think is the reaction they are hoping for. BTW, I’m currently rocking a Focus with 37GB of usable memory and i LOVE it. Of course not everyone can afford to spend more on their SD cards than their handsets. M$ should have sold higher capacity Focuses for decent prices along with their Amazon deals for the holidays. I think people would have liked that a lot. Sent from my Samsung Focus. I am another very satisfied Samsung Focus owner. When I bought it a few weeks ago, I almost had to go find smelling salts to revive the salesperson when I asked about it. He went on to explain that most customers come in looking for either IPhone or Android and are either completely unaware of the new platform or suspicious of it. Even though he liked the platform, he said it got completely lost in the current array of choices for smartphones. Here in Canada I am only just starting to see the wireless carriers give it some attention and show it alongside Apple, Android and Blackberry. I am happy to be part of a new platform and look forward the many updates that I know Microsoft will develop in the future. I thought it was interesting to see at the Amazon website that 3 of the top 5 rated Smartphones are from the Windows Phone 7 platform. My experience with the phone and operating system has been flawless and am happy to show it off to anyone that is interested in looking at it. I do think that a “Flagship” phone would help Microsoft create some buzz and get this platform the attention it deserves. It’s easy. If the others have it, get it! I’m with AT&T and I want a 4.3 to 4.5 inch SAMOLED + screen, and the fastest processing speed I can get. 1 gig of ram would be nice. I agree that MS needs a kick a** phone they can be proud to stand by and promote. Why should WP7 users have inferior devices? Ya know what? I plan to get one. My upgrade is coming in May and I hope that samsung at least uses the infuse platform to make a competitive WP7 phone. If not then something even more innovative will be the only phone acceptable. Period! MS should use that same mu$$$cle that it used to get apps in the market place to get it’s next great device on the shelf. And last, More power to IOS and Android for doing good. I support WP7 because I want to experience something different not because I want the others to fail. We need these companies to compete so we will have innovative and diverse products. In other words… Don’t Hate! I’m in totally agreement with you. If WP7 used the Samsung Infuse platform with just the WP7 os and put this out it would truly be their flagship phone and they would get all kind of attention. Let hope they are thinking like we are. Submitted by Rodney E. Jones on January 28, 2011 – 9:32 A.M. I have been to several stores and found that each employee working there pushes a specific device. I ask them if that’s the device they personally use and they always say yes. Given that Android and IPhone are the most popular amongst most people, those are the phones that sales people stand by. Most sales people don’t have a huge knowledge of the features of multiple devices so I do thank them for at least being honest about what they do know and not pushing unfamiliar products on people to just make a sale. It seems like the problem lies in the influence of the end users decision at the point of sale. Since people are naturally sceptical of new devices, being that they are expensive and that they want to choose a good one, they will gravitate towards the negative, especially if the sales people don’t know any of the positive features of a device. One representative, at AT&T, was asked How many apps were available. He said 2000 but didn’t know of any positive features about the phones to push. The customer moved to the left. Another rep, at radio shack, pushed blackberry and I found out that that’s the phone she personally uses. It’s not so much that she didn’t know about WP7 features, but that she wasn’t interested in learning about anything new or different. SALES ASSOCIATES ARE LOYAL TO APPLE AND GOOGLE RIGHT NOW. MS. MUST INSURE QUALIFIED REPS. ARE IN STORES IN ORDER TO GAIN LOYALTY. START WITH CHANGING THE SALES REPS. MINDSET AND AWARENESS AND SALES WILL INCREASE. WP7 IS A GREAT PLATFORM! Keep in mind that MS doesn’t want the quality of the user experience to change dramatically from device to device. Adding a faster processor or even more RAM may cut out on some very slight lag in some apps (if code isn’t optimized), but it probably won’t make good things go faster. The minimum system requirements were put in place to reduce fragmentation. Developers have a target to shoot for, and if they create their apps for that target then they know that everyone with a WP7 device will be able to run their game or app with equal snappiness. So, unless a developer isn’t interested in reaching a lot of customers, you won’t see them creating apps or games that will use the potential of a high end processor or extra RAM. In other words, adding a powerful processor and more RAM would increase the price of the phone, while adding very little (if any) benefit to the user. This may change in future version of Windows Phone (when they open up multitasking), but I would imagine that will still be over a year away. Hardware like extra storage space, a hardware keyboard, front facing camera, high quality display, etc… would be able to benefit a user who is interested in it. So I imagine that most hardware improvements will be in this vein. Good point Nelson. I can see where things like better screens, HDMI, more storage, dual cameras are most inportant. I would choose them over faster processing speeds and larger ram. You are right, my girlfreinds focus is plenty fast and works great, although I’m still wishing for some new features on mine when I finally get it. I agree that WP7 needs a flagship device. I am on AT&T and don’t want to change carriers. I love taking my own phone to Europe. I have an AT&T Tilt and I am waiting for a 4.3-inch screen. Android phones already have 4.3-inch phones and a future 4.5-inch phone is coming shortly. I am waiting to see what happens at Mobile World Congress in Barcelona before I decide on my next phone. If there is no 4.3-inch phone in the future I will go with the Focus. I got the HTC Surround 7 and it offers Dolby Mobile and SRS Surround. The sound is awesome. Apart form that HTC has a app called Attentive Phone that silences the phone when placed on a surface when ringing, if you shake the phone it lowers the ringer, if it’s in a pocket or purse it will ring louder, if your on the phone you can go to speaker by placing it on a surface. If a very nice app that I believe helps distinguish the HTC Surround 7 along with the pop out speaker that sport a Kickstand and Yamaha Speakers. LG Optimus 7 is a phone my wife got and it offer DNLA, Scansearch and Panarama Shots. It a nice phone as well and it’s processer is faster which really isn’t that much of a difference. I kind of like the physical buttons on the LG over the touch sensitive buttons on the HTC because of accidental touches. The volume button on the LG though is horribly placed. Overall between the two I prefer the HTC. Windows Phone 7 is an awesome phone and I love the Hub Idea over the Apps everywhere approach of the others. Thank God Microsoft didn’t follow the crowd. Oh one more thing. I love the way Zune wirelessly syncs with my phone over my home network. You never have to connect the phone to your PC. I also love how Zune purchases work between my Phone, Xbox 360 and PC. If you got the 360 and a PC your stupid not to get the phone. One more story about the Windows 7 Phone. My wife’s workplace uses Blackberry as their portable office phones so she leaned towards getting another blackberry because of that reason but then went with the windows 7 phone because they might give her a Blackberry instead of using her own personal which did not happen in the end. Anyway she took her phone over to the IT guys and they were stunned how easy it was to connect it to the email system over the Blackberry. I guess the Microsoft Exchange service has something to do with it. They were like there suppose to be more but there wasn’t a need to do more it was that easy to get it setup. What happened to the HTC 7 Pro? It was said to be an exclusive phone for Microsoft Employee’s on Sprint Network in November; but I never heard another word. I think the flagship phone; that will set itself apart from the Droid/iPhone movement, will have a full Qwerty Keyboard for us business users that are looking to downsize from a laptop when we’re mobile. Screen size and speed is important too, but what gravitates business users; with corporate contracts/plans in the SmartPhone arena. The ability to offload ‘work’ onto a SmartPhone device. Word, Excel, Web-Apps; all with data entry requirements; and touch keyboards have awkward feel. IMO. Besides, WP6 users were primarily Exchange users; with elaborate calendaring and contact interests. It’s most likely coming soon. MS wasn’t able to get reliable CDMA compatibility into WP7 before launch, so it was pushed to the first update. I would imagine that carriers already have that update and are putting it through their tests. I think the columnist hit the nail on the head – WP7 needs a flagship phone. The OS is excellent, and would appeal to a great many people but the hardware its on reads as mid-level or entry-level smartphone. When I show off my Focus to friends, I get the same comments over and over again: it’s very cool but the phone feels cheap. I can’t argue with them. I love using the OS but I hate the hardware its on. MS needs what Palm needed for WebOS: a badass handset to show off their OS, preferably on Verizon. These are the reasons why my next phone will probably be Android instead of WP7. And I love Xbox Live and Zune, so I should have been a lock for WP7. Microsoft has a lot of work to do. They need to start getting big updates out fast if they want to be competitive with Android. I can agree with some of your concerns about WP7. Lets remember that this platform has been out for less than 3 months and that IOS had to release a new model to get copy and paste and some other features. IOS was attractive to customers for what it offered, and continued to get better. Second, Nobody really has what’s defined as “true 4G” yet, or is getting it in near future. Look up the actual specs for a 4G network and you will see that all of the new networks like AT&T’s new HDSP+, or Verizon’s LTE are really “3.5G”. So if you are buying a device based on those claims you might not actually see to big of a difference. Wp7 doesn’t have front facing cameras yet, but they most likely will get them. I predict that the samsung infuse platform will receive wp7 software before years end. This will become standard hardware on all phone as video chat becomes more popular. Once again memory card support will be added later to most wp7 phones. We have a Samsung Focus, which has a slot for a card. right on the box it says “support for up to 32gb cards. Plenty of people online have upgraded there’s successfully. I personally want to buy a phone with at least 32Gigs built in, and who wants to spend more money on extra hardware. I personally don’t like not having the option to upgrade, but all those millions if Apple users don’t seem to mind that much. The decision to not add multitasking was made to optimize overall performance. Multitasking sound great in theory, but the current cell phone tech does not support it very well for most phones. Our Focus moves around applications plenty fast mainly because it doesn’t have multitasking using up unnecessary resources. Although I do agree it would be nice in the future, and most likely will come. Adobe Flash, believe it or not, might not be used in the future. Microsoft is focusing on HTML5, which doesn’t require plug ins like Flash to play music or video. Although it’s not available now, a update late this year should bring it. This is looking to the future of web browsing, instead of just trying to keep up with the other’s. But you’re right, why didn’t they at least have flash until the update???? I agree about the app organization. It’s terrible!!!! Good thing its easily fixable with a minor update, and I hope soon. Does AT&T have the navigator tool still?? It has TbyT navigation. maybe an app?? I like Google maps, it works Good. Anyways easy fix. And I agree it doesn’t have the customization of android,,,Yet. For being on the market for less than 3 months it is a good alternative, already surpassing RIM, Nokia and Palm, but that’s not saying much. The platform has a promising future and plenty support which is growing day by day. It took android a year to start gaining ground, and those who jumped on the band wagon early are glad they did. With time WP7 can will be at true competitor. I can name at least 15 features it has out the box that the others don’t. So in the end it’s about what you want. Choose carefully because by one and a half years your phone will be thoroughly outdated, and by 2 years, Oh Man!! But if you are with AT&T I would get the samsung Infuse with android. It sound like it has what you want right now. It’s not out yet, but will be before summer. Look it up and hala at me. Thanks. Of course all of this stuff is fixable, but until it is fixed WP7 will be seen as behind the curve. They’re in a better position than they were with Windows Mobile 6.5, but Microsoft needs to double time and one-up whatever Google is doing because they have a big head start. HTML5 doesn’t solve the lack of Flash problem. If I ever go to a website on my phone and it’s unable to playback the video embedded on the site then the web browsing experience on that device is subpar. I’m not going to blame the websites, I’m going to blame the device. If you want to prioritize HTML5, fine, but the lack of Flash will be seen as a flaw in some mobile devices for many years still. 4G or 3.5G, whatever you want to call it, it means faster internet access. 4G is what people want and unfortunately WP7 doesn’t support HSPA+, LTE, or WiMAX yet. This is going to give Android an advantage for some time. Look at how quickly every carrier and phone manufacturer has adopted the 4G buzz word; it’s because it is one of the main thing that consumers care about. The lack of expandable memory in WP7 wouldn’t bother me so much if it wasn’t for the fact that at least half of the WP7 devices have only a measly 8GB of storage. 8GB of memory was reasonable 2 years ago, not anymore. And even though you can update the memory card in a few devices like the Focus, the ones that allow this require you to completely reset the WP7 device from scratch when changing the memory. That is not true memory card support in the way that Android has it. Yep, you’re right. It’s not a matter of can it be fixed, but will and when it will be fixed. They need to pull the other half of their heads out their asses. I will still remain optimistic. Thanks for the added perspective.